The 15 kilometer Half Boulder begins on the second half of the Boulder Mountain Tour course at Baker Creek. The Half Boulder merges with the late waves of the BMT and finishes at the SNRA Headquarters. The gently rolling terrain of the Half Boulder makes it a perfect introduction for the first-time racer or the participant who would like a shorter workout. 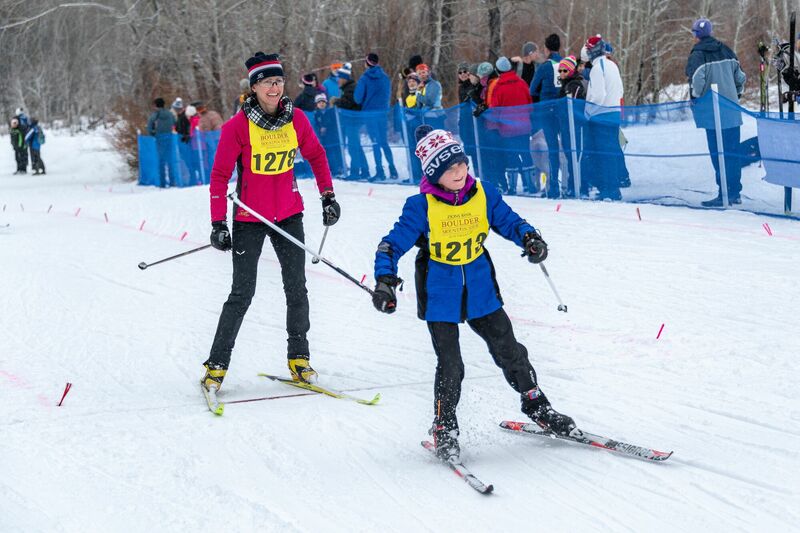 The HALF is designated as a skate race, but a track is set the length of the course and classic and adaptive skiers are welcome. Classic and adaptive skiers are timed as skate competitors. The Half Boulder is limited to 200 registered racers. Special combo entry for adults skiing with children 10 and under. Registration will officially close on Saturday, January 26, 2019. No race day registration. No exceptions. There are NO REFUNDS FOR ANY REASON, even if race is canceled. Present your 2019 Half BMT race entry at any of the following local merchants and receive a BOULDER PASS, good for four FREE days of skiing (includes day of race). Paper or electronic receipts accepted. The BOULDER PASS will also be available at the BMT Expo and Race Bag pick-up. Look for the Blaine County Rec District (BCRD) table. Enjoy access to over 200 kilometers of Nordic trails in and around the valley. Our meticulously groomed trails are managed and maintained by the Blaine County Recreation District. THE BOULDER PASS IS FOR REGISTERED 2019 RACERS ONLY! Family and Friends may purchase a 1 or 3 day trail pass at any of the local merchants listed above or any fee box at trailheads. The course will be open for inspection on Friday, February 1st until 4:00 pm. BOULDER PASS will be required on the trails. Friday, Feb 1, 2019, 10:00 a.m. – 8:00 p.m.
featuring over 20 local vendors and event sponsors eager to share their knowledge about the latest products.
. You can also ask a friend to help you out. Please provide the name of the person picking up your packet. Saturday Bus Transportation – 10:30 a.m. – 11:00 a.m. Buses will transport racers and spectators from Hemingway Elementary School, located on 8th St in Ketchum, to the Half Boulder start at Baker Creek. Buses departing for Galena between 7:00 a.m. and 9:15 a.m. will not stop at Baker Creek for the Half Boulder start. The early buses are for the full BMT racers and spectators only. Return shuttles from the Finish to Hemingway school will begin at 12 p.m. noon and run every 20 minutes until 4 p.m. Your BMT souvenir race bag should be used for warm up and post-race clothing. Clothing and ski bags must be clearly labeled with your name and bib number to be transported to the finish area by the race organization. Make sure all of your belongings are inside the bag before heading to the start line. Please leave race bags at the designated area at the start. You will easily be able to locate your gear at the finish. The Half Boulder starts as a single wave at approximately 11:30 a.m. or once the majority of full BMT racers have passed Baker creek. As with all mass starts, faster skiers will be at the front. Place yourself according to your ability. Hot soup, bread, drinks and cookies for all racers at the Finish. A warming tent may be provided if the weather is unfavorable. Unofficial times will be posted at the finish area as soon as they are processed. Official results will be posted to the website and available for viewing at the Awards Ceremony Saturday night. Awards Ceremony: Saturday, February 2, 5:30 – 7 p.m.
Medals presented to the top three male and female in each age class. All race participants will receive a raffle ticket at the door. Raffle prizes include skis, boots, poles, clothing, bags and training aids from our generous sponsors and supporters.